Today I would like to share my experience providing speech therapy to preschoolers with a larger group, intensive service delivery model. I am happy to be joining in a terrific blog hop organized by Jen Preschern from Speech Language Literacy Lab. It's 30 days of great blog posts to celebrate Better Speech and Hearing Month. If you are just getting started in the hop, be sure to check the link at the bottom to find more great posts with freebies and tips from over 30 bloggers. I have lots of preschoolers on my caseload. Over the years, I have learned a bunch from these adorable, huggable, wiggly, sniffly, and enthusiastic little ones. Most three and four-year-olds are not ready to sit for extended periods of time and drill on skills. They need movement. Play is the natural way for little ones to learn. Be sure you keep plenty of tissues and hand sanitizer on hand! Thematic activities are powerful ways to teach vocabulary. Themes build a meaningful framework for new vocabulary and help link new words to existing experiences and knowledge. Little ones are multi-sensory learners. They need to experience see, feel, listen, taste and manipulate materials for maximum learning and progress. Be prepared to give and get lots of hugs. And a few tears. Children with phonological disorders often need intervention for delays in a range of language and phonological skills. They are at risk for reading struggles. It is difficult, and often inefficient, to target each need one by one. Storybook reading and play activities provide rich opportunities to target multiple skills at once. Skills learned in context, integrated into natural communication, have the best chance of carryover outside of therapy. A few years ago, my district was challenged to develop new programs for preschool speech students. A colleague and I became interested in programs that served children in a more natural communication environment than the traditional 30 minute, walk-in session. We visited two pilot programs in our area which offered longer sessions in a preschool-like setting with larger groups of children (up to 10). We thought “Ten kids in a session, are you kidding?” But it worked, the therapist had an assistant, and the kids rotated through centers. More about that in a minute. We really liked the format, because it was literature and theme-based. There is much evidence in the literature about the benefits of adult-child storybook reading. This program provided opportunities to efficiently build alphabet knowledge, print awareness, phonological awareness, and oral language skills. It provided intensive articulation practice. We decided to start a similar program in our district, got the green light from admin, and were assigned a paraprofessional to assist. We called our program LEAP: Language and Early Articulation for Preschoolers. We quickly realized that while we could pattern our program after the framework of other districts, we were going to have to develop the lessons ourselves from scratch! We used the book, Once Upon a Sound by Linda Smith-Kewel and Tracey Molenaar Claeys as a starting point. We added, adapted and substituted books and activities to suit our children’s needs. Together, we spent many long hours that first year developing lesson plans. Now we are wrapping up year four, it has gotten so much easier, and I am still loving it! We serve 3, 4, and 5-year-old preschool children in our LEAP program with mild-moderate language delays or any level of articulation delay. Each group is seen for two hours, twice a week. Children with more severe articulation disorders may be seen for additional sessions. We have a paraprofessional assistant. (You don’t want to try this by yourself!) Our assistant is intuitive and amazing, and has learned to prompt the children throughout the session. The kids are receiving modeling, scaffolding and correction many times per session from both of us. We use a cycles approach for articulation: all activities reinforce a chosen phoneme/ phonological process target each week.The targets are changed weekly. Language skills are integrated throughout each session as well. What do sessions look like using this model? Sponge Activity: I show a YouTube video or two, while the kids are getting settled and using the restroom. I am fortunate to have an interactive whiteboard. Literacy skills are important for our speech-delayed kids, so I always show an alphabet video, then one on the weeks’ theme and targets. Movement Activity: This helps to get the kids ready to attend. Patty Shukla has some awesome videos for this on YouTube, like this one: JUMP! We sing, we dance, and we do fingerplays. It’s a blast! Introduce the Weekly Target: We write the letter or letters that make the sounds on the board and I model the sound for them while demonstrating placement. I have a feely bag with small toys in it beginning with our sound. Kids adore reaching in to see what’s inside and name it. Sound-Loaded Storybook: Literature-based therapy provides the opportunity to work on so many targets at once. We read the story, use puppets, objects, and magnet board pictures to illustrate, retell and act out the story. There are so many opportunities to scaffold and expand utterances during storybook discussions and narrative re-telling. 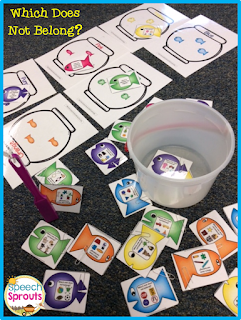 We work on print awareness, phonemic and phonological awareness: We identify words with our sound, discuss rhyme, and clap out syllables. We answer WH questions, predict, discuss basic concepts, new vocabulary, and categorize whenever the opportunities arise during the story. All with one efficient activity! I have developed an extensive list of sound-loaded books to target each phoneme. Read more about this on my blog: Sound-Loaded Storybooks For Articulation. I offer the list as a freebie, so be sure to check it out. Centers: Children rotate through each center for 5-10 minutes each. 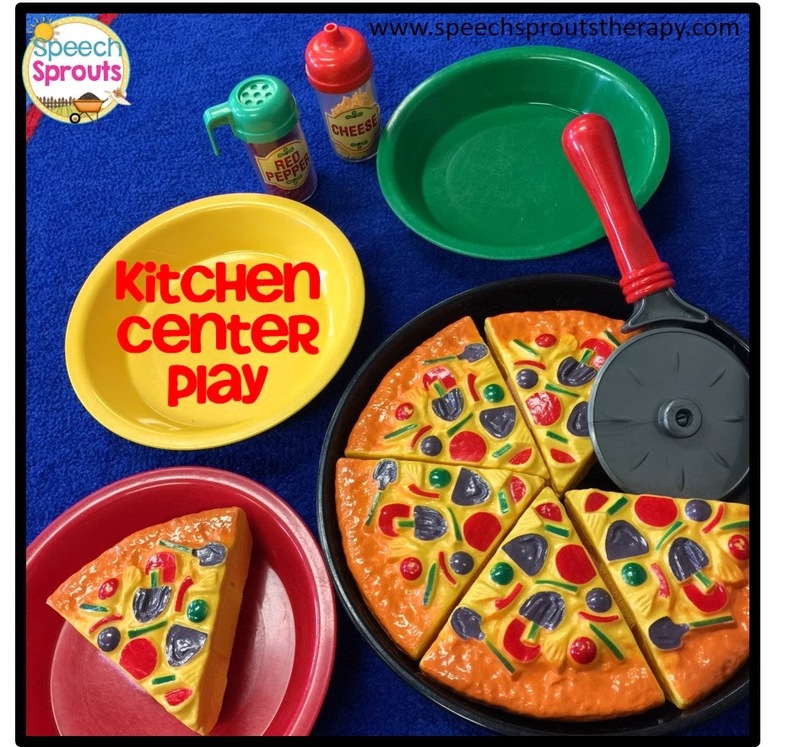 Kitchen Center: Play food and dishes for imaginative play. Activity Center: Toys are chosen for the weeks’ target. It may be a farm set for initial /f/, cars with a street scene carpet for velars, or stacking cups for final /ps/ blends. Puzzle Table: puzzles, file folder games, cookie sheet activities featuring the chosen targets. We have a Humpty Dumpty puzzle for initial /h/, or colorful printed fish to make an “ocean” for final sh. We also put sensory bin activities here. Computers: I have three student computers in my room. We created a PowerPoint auditory bombardment for each target. The children listen and watch the bombardment activity on the first computer, then move to the next one and use language and phonological awareness software. I like the Buddy Bear software (Autism and PDD series) from Linguisystems and my old copy of Earobics. Art Table: My assistant works with 2-3 children at a time doing hands-on activities designed to elicit plenty of artic repetitions. She gets to have all the fun! There is painting, play doh activities, making booklets, stringing, gluing, washing, tasting, digging, matching, fishing, game-playing, you name it. The kids get practice making requests as they ask for materials. My assistant corrects and models for the kids, reinforcing vocabulary, syntax and sentence structure skills. Ipad: The kids engage with apps chosen for language or thematic content. Library Center: We stock a bookshelf with a different selection each week of books that reinforce our target. Add a beanbag for a comfy reading spot. Speech Time: This is one-on-one time at the table with the SLP. We work on each child’s specific needs, articulation words and language targets. I use a variety of super-quick motivational activities to make it fun. Back on the carpet, we discuss our activities for the day, providing practice on past-tense verbs. If time allows, we read a second story. I love sending the student’s work home to provide more opportunities for parents to discuss/practice with their children. How on earth do I keep all the lessons and materials organized? 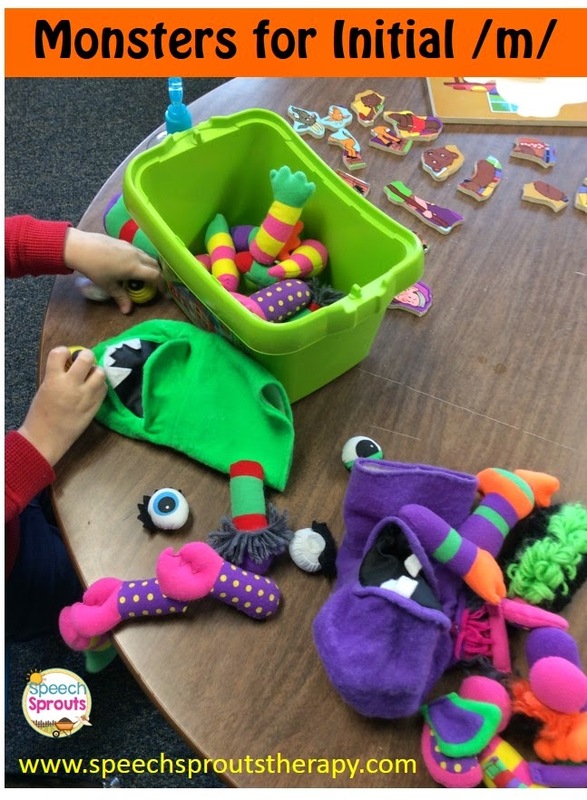 Read about organizing for Grab-and-Go Articulation Therapy HERE. Whew! It’s a jam-packed two hours. Parents, principals and kids love it. 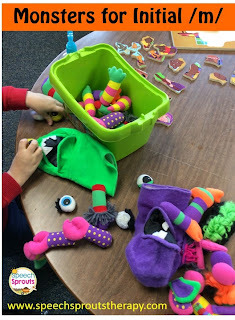 I love it because it provides me the opportunity to work with each child individually, to incorporate pre-literacy skills, and provides tons of opportunities for language and artic practice. I get to develop a deeper understanding of each child and see how their skills carry over into genuine, functional communication during our busy, activity-filled sessions. We have found that we are seeing fewer of our children retained in kindergarten, better progress in language skills and often faster progress in articulation skills as compared to a traditional therapy model. If you love the idea of literature and theme-based therapy, stop by Speech Sprouts and see what else I have for you! That's Fishy! Which Does Not Belong? Come visit on May 30th when my friend Linda from Looks Like Language will guest post here at Speech Sprouts with some great ideas about The Importance of Social Language Skills. You should definitely check out the rest of the posts in this great blog hop! See the whole list here at SpeechLanguage Literacy Lab. Hi Jessica! I am glad this post was useful to you! I will have more posts coming, in the meantime, check out these: http://www.speechsproutstherapy.com/2015/05/speech-therapy-can-be-picnic.html and http://www.speechsproutstherapy.com/2015/05/speech-therapy-can-be-picnic.html. I had 18 preschoolers in two groups in this program by the end of the year. Most activities can be easily adapted for push-in or pullout. Be glad to talk to you about it any time! This seems more articulation focused. Any detail recommendations for intensive language intervention (increase vocabulary, expressive/receptive) for preschoolers? Hi Dell! Thanks for you comments. We do have a solid focus on articulation, but integrate language targets too. The storybook readings are perfect for both, as are the hands-on activities. We work on wh questions, vocabulary and sentence construction daily. Language concepts? We discuss short and long when we target initial sh, size concepts large and small for /sm/. Three Billy Goats Gruff is awesome for initial /g/, but also perfect to discuss the concept of under. Five Little Ducks is perfect to teach plurals, -ks blends, position concepts far/near, quantity concepts some /all, categories (pond animals/farm animals) and narrative re-tell. You get the idea! 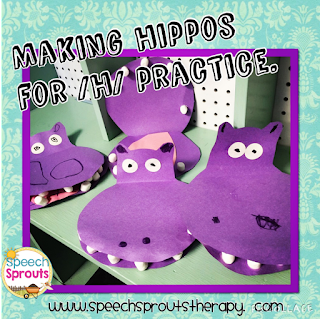 Stop by my Speech Sprouts on TpT to see some units I have created and maybe get some ideas. You also may like to check out some of my other posts such as http://www.speechsproutstherapy.com/2014/10/bats-cats-and-rats-final-blends-and.html We have tossed around the idea of a language-only group, but haven't implemented that yet. So many of our kiddos have both needs. Glad you stopped by! Lisette, I used to run a group based on a similar model. I called it Speech Impact and it was a much smaller group because I ran it myself! It was based on Sue Berman's work from UW Marquette called Phonology and Language Group, (PAL). I ran it similarly to how you run yours but the first few years, I also included a snack based on the letter/sound. Sue Berman has a great book, (somewhat of an oldie but a goodie depending upon your definition of "old") called "Phonology for Groups" that was one of my "go to" resources for this group. Thank-you for this post, it made me miss running that group! We stopped it when we went to community-based 4K because all of my group candidates were spread out at so many centers. Great post and beautiful website-love it. Donna, I have Phonology for Groups! Honestly, I haven't pulled it out in a while, but I will now. Bet there's some great ideas in there. It's interesting to hear how others have formed groups and how they have tweaked a model to work for them. Glad you enjoyed it, Thanks! I re read your post and just had to comment again. This was really well written and I wish we had a similar program by me. Do you assess avg preschool focus equivalent to their age, ie 3 years old = 3 mins? Do you have examples of thematic units or you can direct me where to purchase what you've created? Can you provide examples/curriculum of skills through storybook reading? Can you elaborate on how one can use your cycle approach for vocabulary/expressive language? My kiddos are in each center from 5-10 minutes, depending on the activities and how many children I have in the group to rotate through. Even the 3 year-olds manage this nicely. I have created several thematic/ literature based units and have them available in my Teachers pay teachers store, Speech Sprouts. 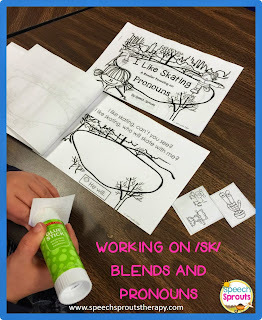 You can find it by Clicking the TpT button at the top of this page, or head here: https://www.teacherspayteachers.com/Store/Speech-Sprouts. I am off for the summer now, (yippee! ), and plan to be busy creating, so be sure to follow me there if you are interested. I love your insightful questions, I think I could write another whole post about teaching language skills with thematic play and storybook reading! I will work on that for you, watch for that soon! Hi Kristin! I love that set- it comes with 3 houses, three pigs and the wolf. Its by Melissa and Doug and called Three little Pigs Playset. I see it is carried by Toys R Us,also several places online. Hi Sahara! My program is provided in my room- and I have been given a full-sized classroom to do it. About 1/2 of my students are speech-only walk-ins, the other half also attend our integrated Pre-K program. I pull them 2x a week for my program.